Some innovative IT colleagues of mine here at Penn have made a short film about our use of the virtual world "Second Life" here. They interviewed me for it, but I'm not nearly the most lucid proponent of experimenting in SL. Watch for others. 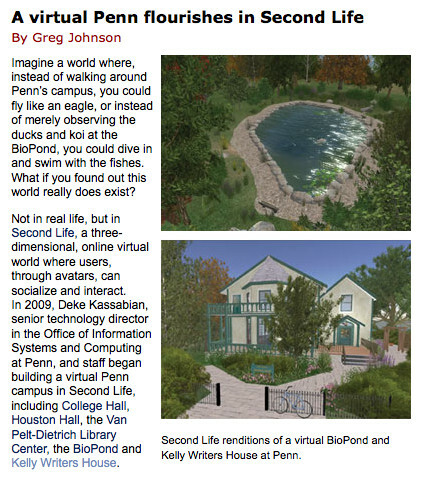 The Penn Current currently runs a story by Greg Johnson on the virtual Penn campus in Second Life, including, of course, our virtual Kelly Writers House. 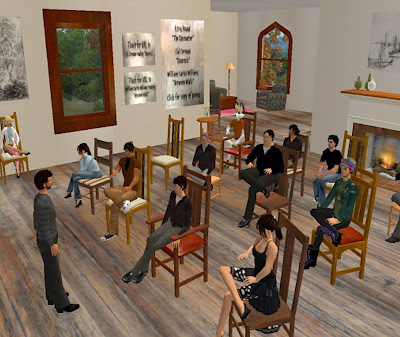 Here "I" am - my avatar, Alf Fullstop - teaching modernist poetry last night to a group of folks from around the world (one from Puerto Rico, another from Hong Kong) in Second Life's virtual Kelly Writers House. 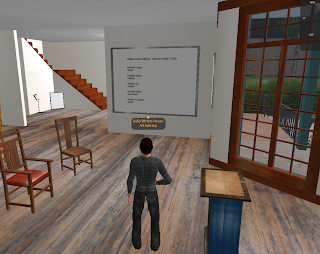 At left you see my avatar, Alf Fullstop, preparing to lead a seminar in the virtual Kelly Writers House in Second Life this coming Thursday evening.At left you see my avatar, Alf Fullstop, preparing to lead a seminar in the virtual Kelly Writers House in Second Life this coming Thursday evening. The poem on the wall, WCW's "Between Walls," is the third of three poems I'll be teaching.